(NEW ORLEANS) St. Paul’s student media showed that they were a force to be reckoned with at the Journalism Educators Association (JEA) conference held on the campus of Loyola University on Feb. 1, 2018, taking home multiple awards, including Paper Wolf Editor-in-Chief Luc Hebert winning the State Journalist of the Year. As part of the State Journalist of the Year award, Hebert was awarded a $150,000 scholarship to attend Loyola’s Mass Communications program and an invitation to represent the state of Louisiana at the national JEA conference in San Francisco in April. For Hebert, the award represents a completion of his high school work as a journalist and prepares him for future endeavors. “(This award) gives me a great springboard so that when I do decide to write for a newspaper in college, it verifies my ability,” Hebert said. 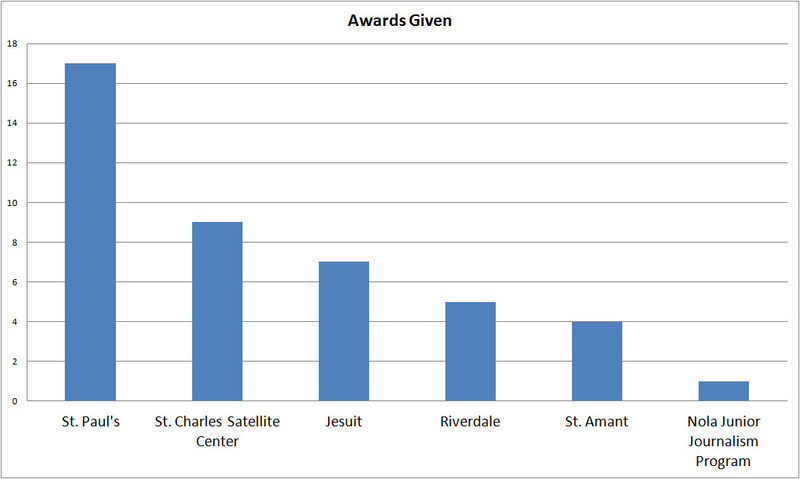 St. Paul’s took home 17 of the 42 awards given at the conference, more than any other participating school. The Paper Wolf won 10 of the 17 awards given in the print category, including Best Overall Website; First Place Sports Photo and First Place Feature Photo to Brandon Gallego; First Place Headline to Jackson Cretin; First Place Feature Writing to Lester Guttuso; First Place News Writing to Ashton van Deventer; First Place Sport Writing and Third Place News Writing to Carson Caulfield; Second Place Editorial Writing to Luc Hebert; and Third Place Editorial Writing to Forge Mathes. Guerilla Wolves won six of the 24 awards in the broadcast category, including First and Second Place for Weekly News Show; First Place Live Non-Sports Broadcast to Brandon Gallego, Joel Fernandez, and John Meyers; First Place Broadcast Feature Story for John Meyers; Second Place Entertainment Video to Caulfield, Frenandez, and Gallego; Second Place PSA (longer than :60) to Fernandez and Gallego. In addition to the award ceremony, seminars were held to help further educate student journalists in various print and broadcast media topics. Louisiana JEA president and instructor at the Loyola School of Mass Communication Albert Dupont told the Clarion Herald what they hoped for students to achieve at the conference. “The conference is designed as an opportunity for high school students to build professional skills and begin envisioning a possible future in journalism and communications,” Dupont said. Students in attendance plan to utilize their experiences to improve their work as journalists. Paper Wolf Sports Editor Carson Caulfield is a big user of social media for The Paper Wolf and was also interested in learning different ways to use it. Members of St. Paul’s student media will further educate themselves on such matters by attending the Columbia Scholastic Press Association Conference to be held at Columbia University in March.